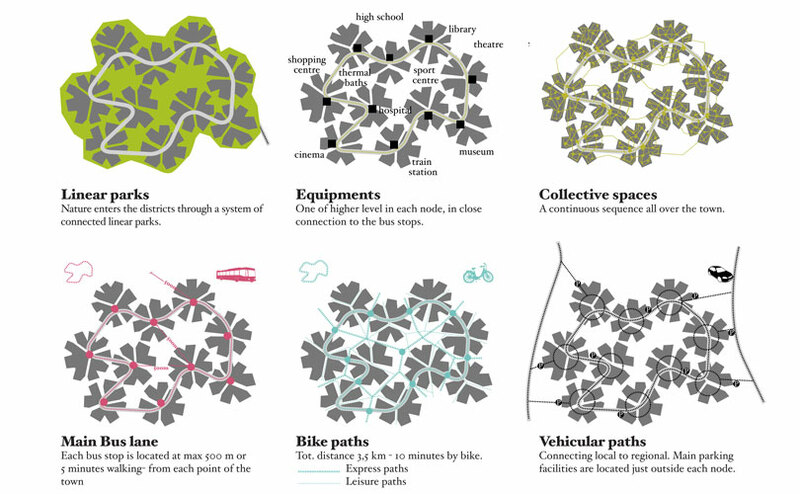 The challenge is to get a dense and vibrant urban space, without interrupting the existing natural conditions, but including them in a continuous exchange with the built environment. 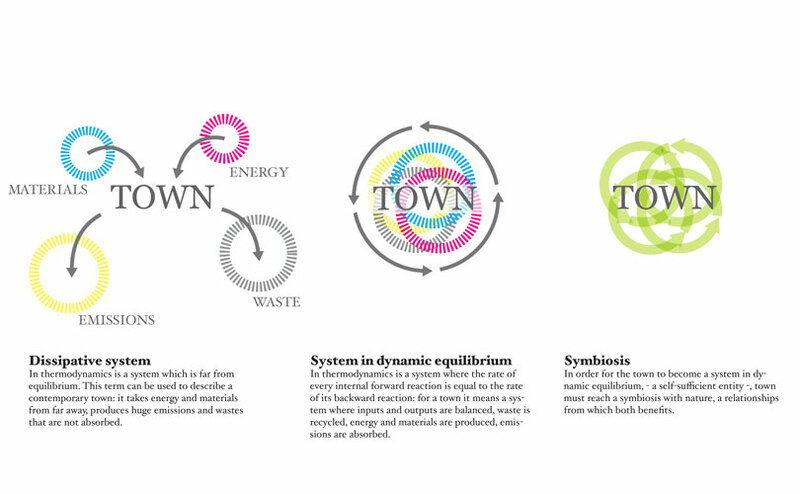 To get to this goal, nature and town have to grow together in a strong relationship as two interconnected ecosystems. 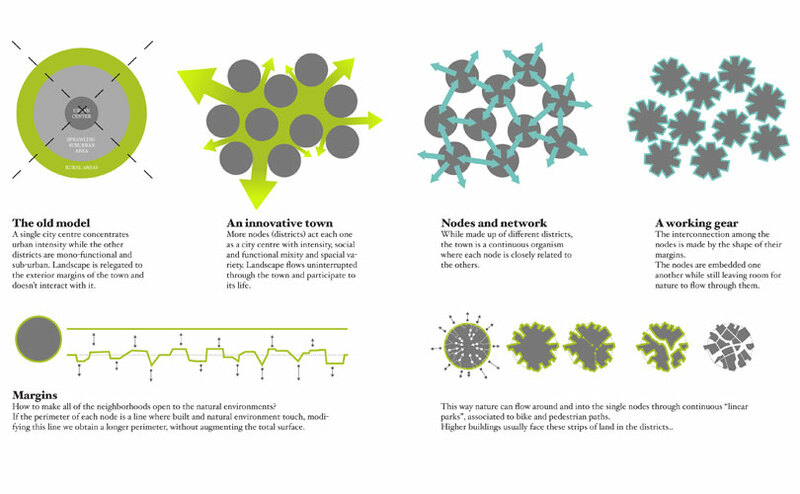 We considered a town composed by more nodes closely interconnected among them. 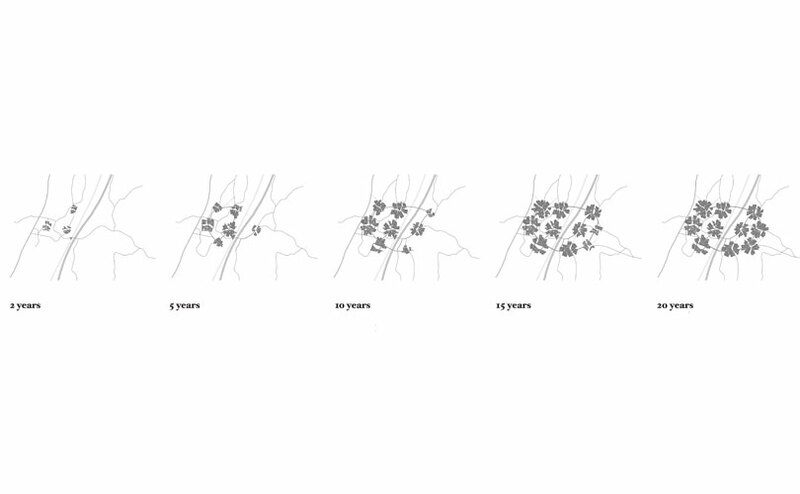 Each node is part of a network that constitutes the whole town and the way the single nodes are connected one another lets nature flow throw the system, making a balanced void/full system at this scale. 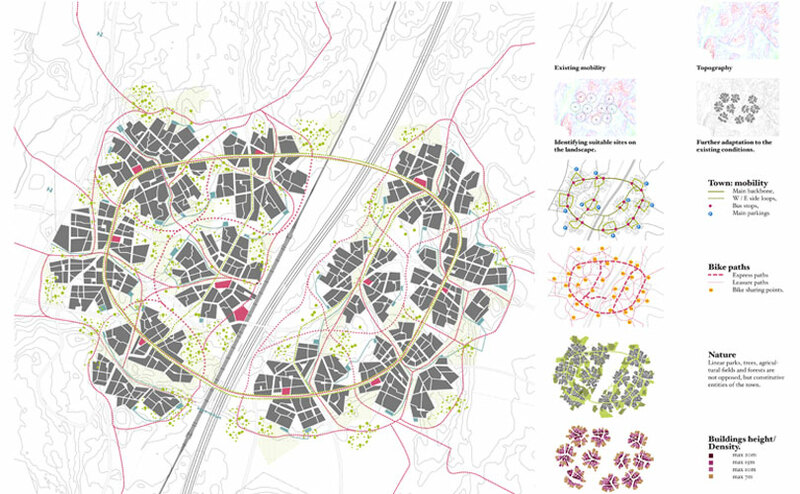 Each node can host up to 2000 people, this reduced scale allowing to deal with the need for a self-sufficient urban unit on different scales. Each node measures about 250 m, the maximal distance inside a pole is 500 m, 5 minutes on foot. This distance determines the diffuse presence of the basic services. 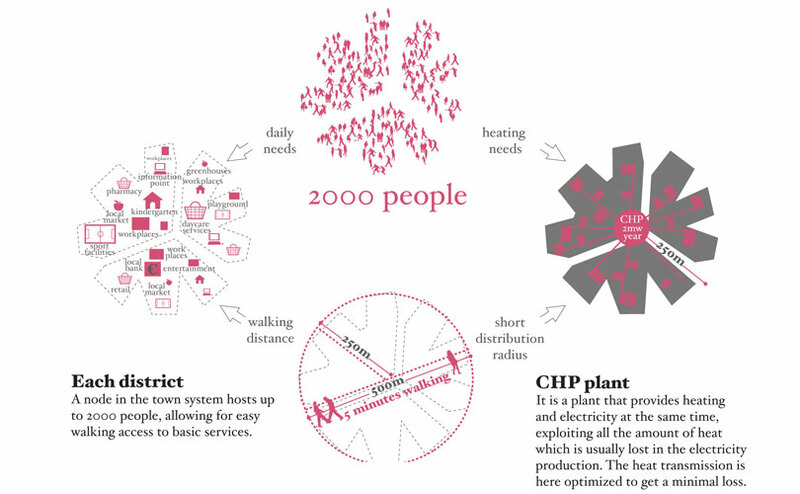 The needs for heating can be satisfied, at the scale of a node, by a small CHP plant. 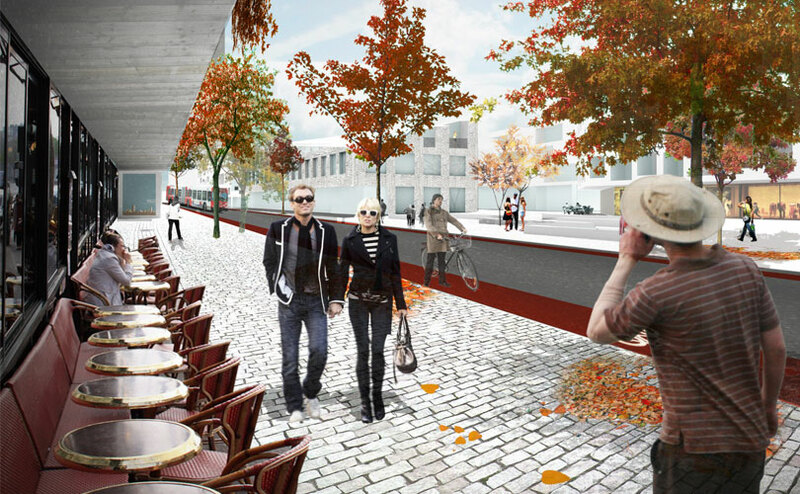 Like in the old towns, where the “shape” of the districts depended on the need for water and on the access to the market, in this project the dimensions of the nodes are similarly determined by the needs, in terms of energy, of “urban life” and easy pedestrian access to services. The single nodes are crossed by a large boulevard which is the backbone of the transportation system. 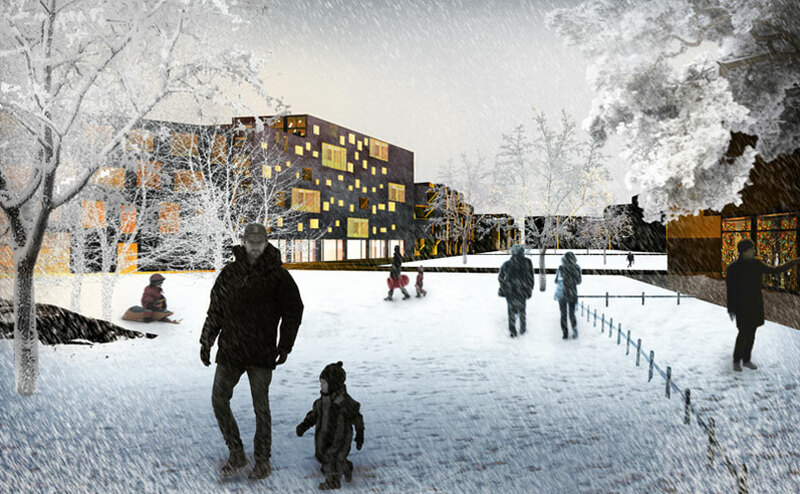 The issue of ecological efficiency is taken as a key point for the process of designing the town and it influences the orientations at each level. A holistic approach helps conceiving a strategy that takes into account a whole range of multiple processes, parameters and actors influencing one another. – Landscape is seen as an infrastructure. 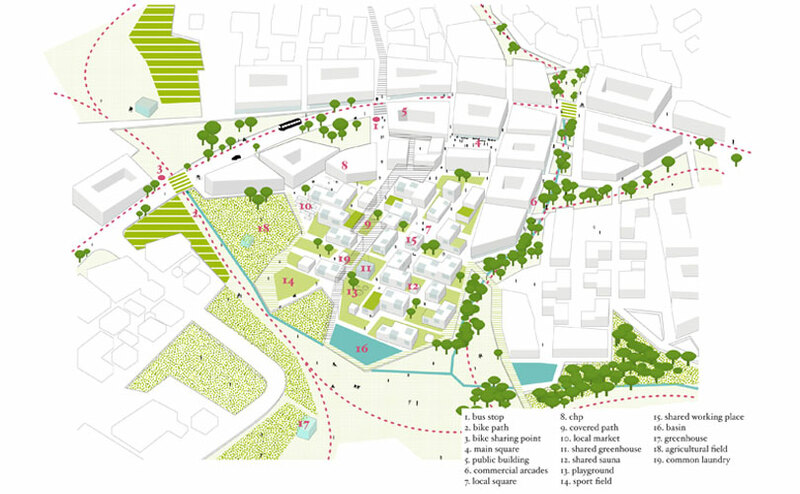 This new model of town is seen as a synthesis between the needs of contemporary citizen to be in contact to a lively environment close to work and leisure opportunities, which is usually intended to be in a city, and a more relaxed and independent way of living, closed to nature and “related” to open spaces. The density mixity (co-presence and distribution of multiple functions) is an important indicator taken into account: it is usually a characteristic of city centres and it disappears in mono-functional suburban areas. 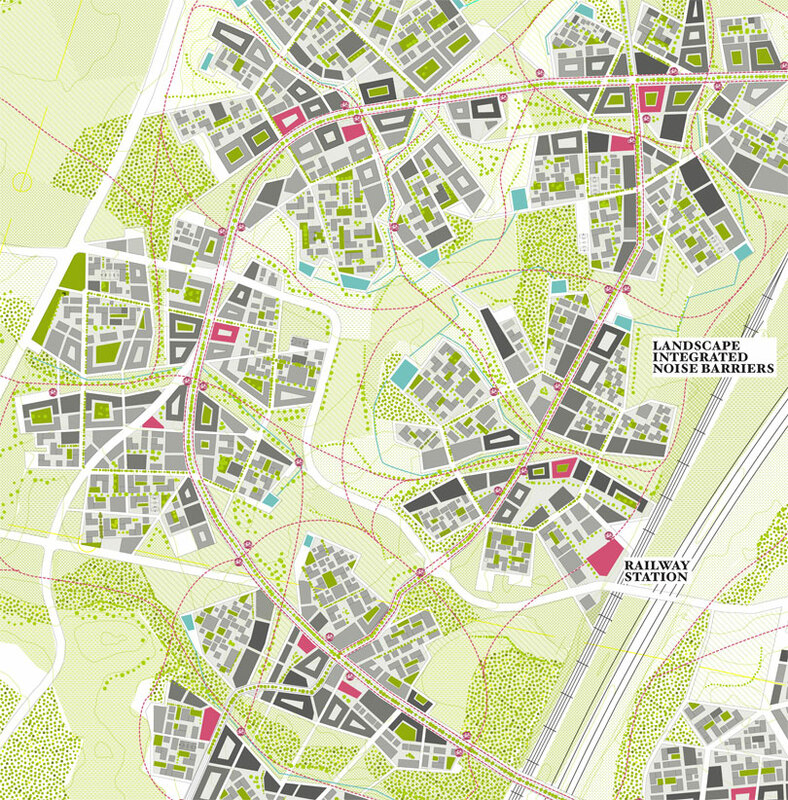 Here it informs each sector of the city and it is usually obtained as an hybridization of the residential types. 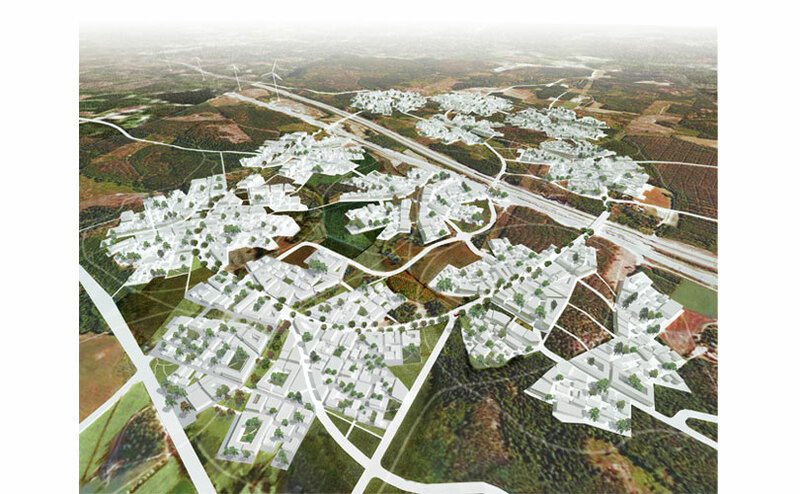 Our proposal for an innovative town is extremely adaptable to a large variety of possible existing conditions, so that the landscape has to be shaped only in minimal part, in order to fit the new implantation. We took the special existing features of the Henna site: infrastructure, topography, presence of forests and agriculture etc. and included them in the planning from the beginning. The site specific features and identity will not be erased but will be enlighten by their new relationship. The margins of the single nodes follow the agricultural limits, the existing topographic features and, like platforms overlooking the sea, they become territories from where one can be confronted to the landscape’s beauty and complexity. The linear parks run through the districts like canals, but they are also infrastructures: going across them, one can reach different points of town, while always staying in an natural though urban ambience. 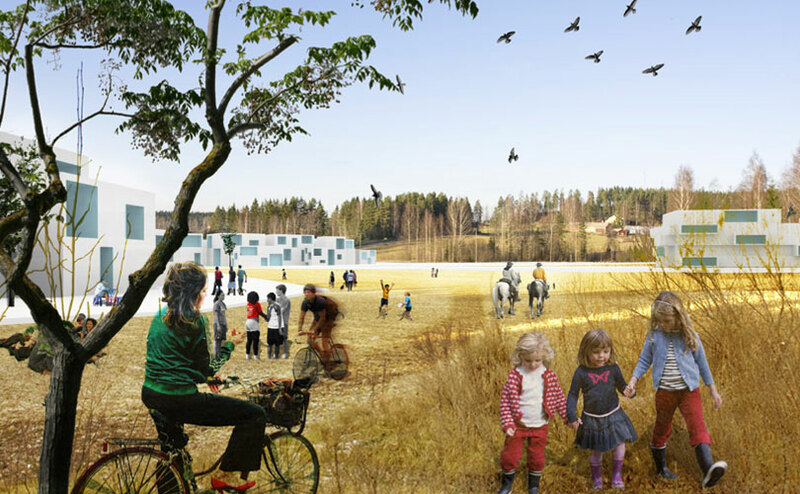 The idea is to promote a town which is self sufficient, ecological and energetically efficient, while not associating it to the cliché of the “eco-city” and its nowadays ubiquitous “aesthetics”. 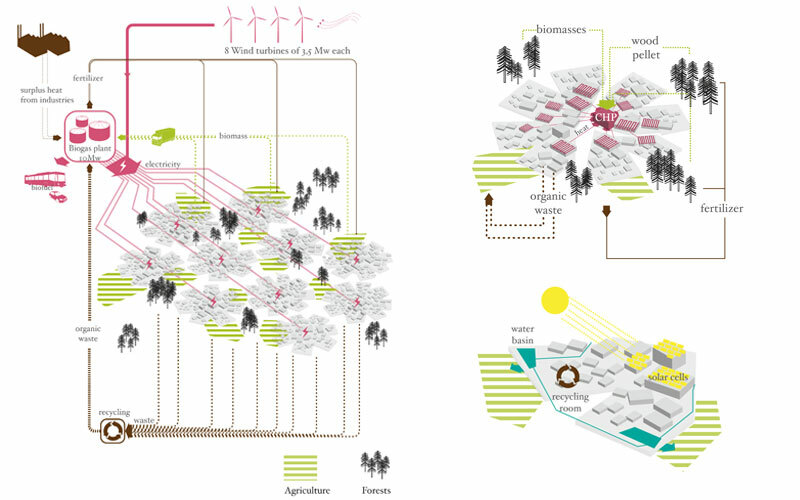 Here, a small ecological footprint is obtained by restoring a close contact and exchange with the surrounding territory, optimizing the town shape to the mobility issues, the energy production and saving and using up to date technologies to re-interpret the archetypical relationship town/nature. 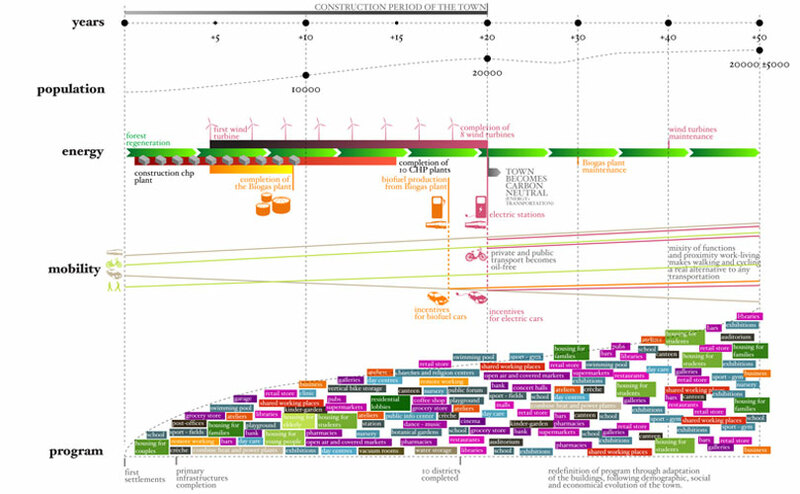 We have chosen not to expose the contemporary high tech tools as a flag that would only help to get a easy, (and easily obsolescent), “ecological image”, for a fast acknowledgement. The domestic ambiances, the everyday space that connote a town, here meets a territory that has become no longer familiar for contemporary urban inhabitants. The ambiguous geographies of a land to discover are merged with the urban fabric, creating stripes of lands through the buildings. 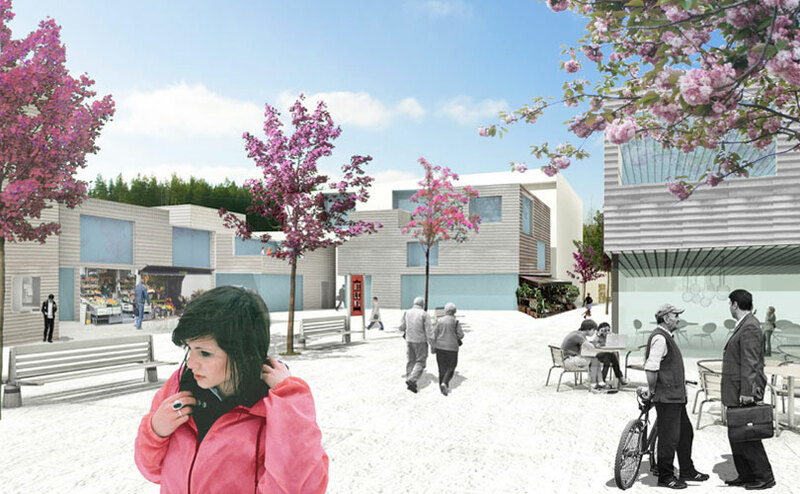 These spaces, where the built environment is therefore suspended, are constitutive parts of the town: this territory becomes a strong part of the urban unit, not its opposition. While the town gets a territorial dimension, the territory assumes an urban character. The two subjects establish different layers of relationships through a strategic presence of mixed uses in both of them and the definition of new, lighter infrastructures. Henna will get the richness of a big city, where there are always new areas to explore and events to be surprised from, with the advantages of a smaller scale town, where work and opportunities are close and a sense of community characterizes the urban life.